Save up to 65% on your vacation at Luxury Link. Click for the best package specials. Save up to 40% with these exclusive travel deals from LuxuryLink.com. Travel just once in complete luxury and it will change your idea of vacation forever. Live like royalty without paying for it by booking a dream getaway for up to 65% off to the world’s most desirable locations at LuxuryLink.com. Find paradise at a price you can afford by using a Luxury Link coupon code to book a stay at the resort of your choice and reserve your savings today! Treat yourself like a VIP and experience the incredible comfort of staying in a 5-star resort. Over 500,000 elite travelers rely on Luxury Link to discover new places to visit and book their stay at extravagant locations from the shores of Hawaii to the wine region of Italy to the Great Wall of China and back again. Luxury Link partners with the most extraordinary destination hotels, resorts, cruises, and villas in the world to bring you exclusive deals on unforgettable vacation packages. Luxury Link offers two terrific ways to save. Users start by searching destinations by location, type of travel, or the hottest deals and browse through thousands of listings. When you find something you like, select an available date, and choose between the “Book Now” and “Auction” options to get savings up to 65% off standard prices. The “Book Now” option gives customers the option to pay a set fee and cancel or change reservations, but that flexibility typically comes at a slightly higher price. For bigger savings, try a Classic Auction. Find the luxury package for you then start bidding. Enter your opening bid and actively monitor the site as others outbid you and compete for the same package, or enter a maximum bid and come back later to see if you win. Feeling adventurous? Bid on a Mystery Auction for as little as $1 without knowing just where you’re heading until the auction ends. Diane McDavitt and James Kaplan cofounded Luxury Link in 1997, bringing lavishness to the masses. The site has been featured in The Wall Street Journal, Travel and Leisure, Modern Bride, and CNN Travel as one of the best and most innovative travel websites online. Isn't it time you see why? On top of working with some of the world’s most elite clientele, Luxury Link stays connected and gives back to to the greater community it serves. This Los Angeles-based company has made generous charitable donations to local organizations including the Los Angeles Regional Foodbank and the nonprofit organization Heal the Bay. Additionally, support has been given to UNICEF and the Habitat for Humanity, amongst others, to make a difference wherever their customers travel. At CouponPal, we’re visiting every corner of the World Wide Web to bring you the best deals and lower your costs even further. Book your next vacation with a Luxury Link coupon code and get a price as delightfully indulgent as your stay. Going on a luxurious vacation starts with treating your checkbook right. Get the best deal on 5-star accommodation worldwide by following this step-by-step guide to use a Luxury Link coupon code to make your next reservation. Once you find the deal you want, go ahead and click it. This page will redirect to LuxuryLink.com and a new window with the code will open. Find the vacation package you want and click on “Next” whether you select the "Auction" or "Buy Now" payment option. 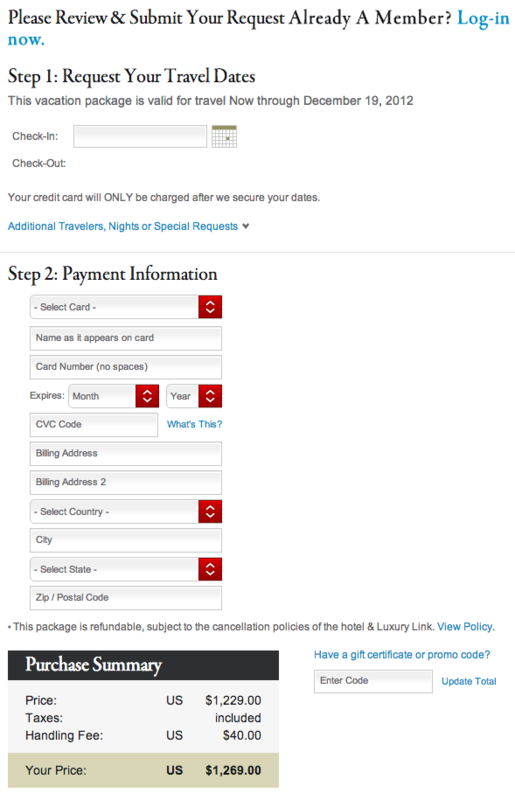 If you are a returning Luxury Link customer, sign in to access your account. Otherwise, submit your email address and click "Continue." Enter your travel, personal, and billing information. Click "Have a gift certificate or promo code?" 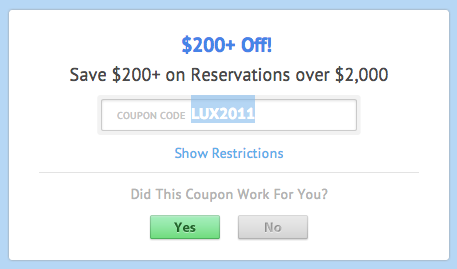 Paste in the Luxury Link coupon code from CouponPal and click "Update Total" to receive your discount. Fill in any remaining information and click "Submit Request" to complete the order. At Luxury Link, you can save up to 65% off some of the world’s top hotels and resorts. Think of the places you could go with all that money you save! With every type of lodging - from ranches and resorts to castles and villas - there’s the perfect kind of vacation for everyone. 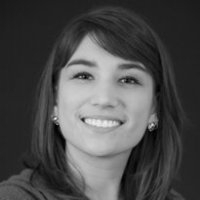 Here are a couple of questions you might come up with while using the site. 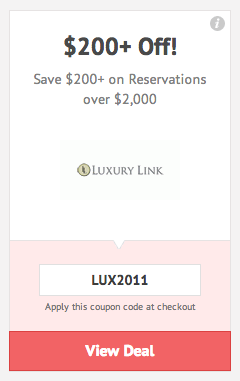 Why isn’t my Luxury Link coupon code working? If your Luxury Link coupon code isn’t working, check to see if there are expiration dates or minimum size orders attached to the deal. Also, be sure that the coupon you’ve selected corresponds with the type of package you’re purchasing; some of the deals only apply to specific reservation types. You can reach customer service by calling 1-888-297-3299 or 1-310-215-8060 (local), Monday through Friday from 6 a.m. to 7 p.m. or Saturday and Sunday from 9 a.m. to 4 p.m. (all times PST). You can also email them at Contact Us. Luxury Link currently accepts all major credit cards. What are the two ways to book vacations? There are two different ways to make reservations at Luxury Link. You can “Book Now,” which lets you have flexibility over your travel dates and the length of your reservation. The other option is to participate in an “Auction.” “Classic Auctions” are conducted by you placing a single bid or continuing to bid once others outbid you. You then choose the dates you wish to travel after the auction closes. There are also “Mystery Auctions,” where bidding starts as low as $1. However, you won’t know the destination unless you are designated the winner of the auction. No matter which you choose, you’ll find amazing saving opportunities! How can I find out about Luxury Link news? If you’d like to get alerts about exciting Luxury Link trips, sign up for the free email newsletters on the homepage. You’ll get updates about exclusive savings and editor’s picks for trip ideas. The best part? When you sign up, you’ll receive $50 off your first reservation! The Refer a Friend program is just one more way Luxury Link allows you to earn some extra savings. By referring a friend to the site, you can earn $50 off your next booking. You’ll also receive a $50 credit the first time your friend makes a reservation through the site.